Similar to the last car I owned. Before that I drove a Volvo 121. Seems like eons ago. The last time I sat behind the steering wheel of a car was back in 1989. 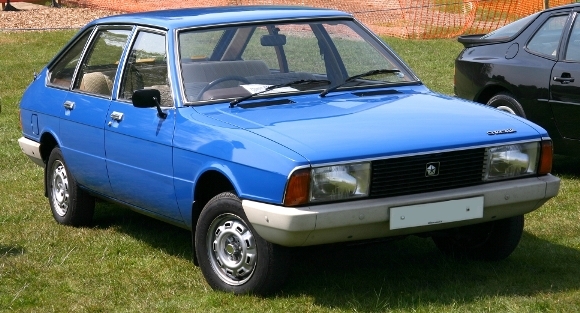 I had a car then, a sky-blue Chrysler Alpine, which cost a bomb to maintain. As soon as both my daughters left for studies overseas, I sold my Chrysler. I had no further reason to own a car. My chauffeuring days were blissfully over. For the past 26 years I have been relying mostly on public transport and the kindness of friends with cars to get around. Every now and then, I am tempted to get a car, but the mere thought of horrendous traffic jams, parking problems, road bullies, maintenance costs and most of all, the spiralling price of fuel, is enough to deter me from visiting the car dealer. My friends (all of them drive) tell me they would be totally lost without their car. They wouldn't have a clue how to get from Segambut to Sunway, or from Kampung Attap to Kampung Pandan. They can't imagine how I could survive for so long in the city without a car. 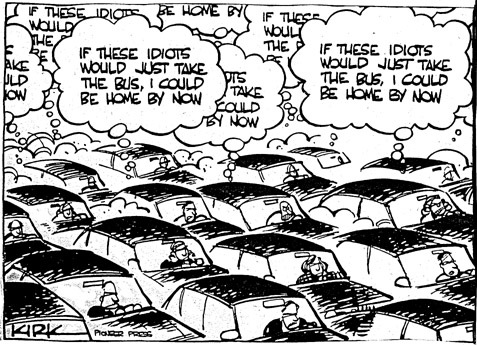 If caught in a jam, I would rather be in an air-conditioned bus reading my book, taking a cat-nap or checking out what car drivers are doing in their vehicles from my higher vantage point. You would be surprised if I told you! 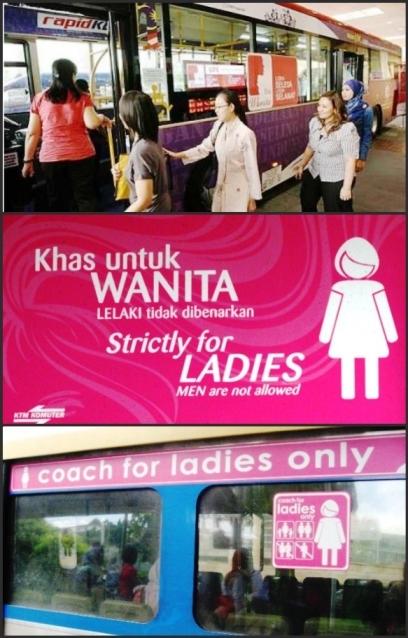 While I can understand where they are coming from, I have to admit there have been vast improvements in our public transport system since SPAD took over the management and administration. 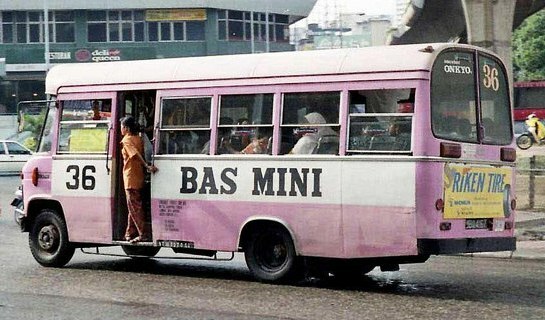 Sure, I still have plenty of grouses, but I am glad those terror days of the pink mini-buses are gone forever. They are a menace on the road, and from 1 Dec 2015, I will be just as happy to say goodbye and good riddance to those about-to-fall-apart Metro buses plying the Ampang routes. They should have been despatched to the scrapyard decades ago. Buses today are air-conditioned, reasonably clean, comfortable and generally reliable. I'm referring to the Rapid KL buses. Senior citizens aged 60 and above travel half fare with the special warga emas card. You can apply for one at the Concession Registration Counter located at Pasar Seni Bus Hub next to the LRT station. Remember to bring along your MyKad and a photostat copy as well. Just fill in the form and pay RM5 which will be credited to your card. You can start using it right away. Free shuttle buses take commuters and tourists to the city's landmarks as well as to major shopping malls. Don't know how to get to your destination by bus or train? Just go to MyRapid portal to plan your journey. That's what I do when I have to go somewhere for the first time. The portal tells me which bus or train to take, and the fares. An electronic board outside KLCC displaying bus schedules. This photo was taken in June 2015. Waiting time has since improved even further with the addition of more buses. There are now more buses, including double-deckers, on the roads, so waiting time is much shorter. The best news is the introduction of Go-KL buses. These buses offer complimentary rides on four routes named after colours: green, purple, red and blue lines. Together they cover all the major landmarks and shopping malls in the city like KLCC, Pavilion, Pasar Seni, Sentral, Chow Kit and Kota Raya. Having taken many rides on these buses, I highly recommend them. Waiting time is only 5-10 minutes. 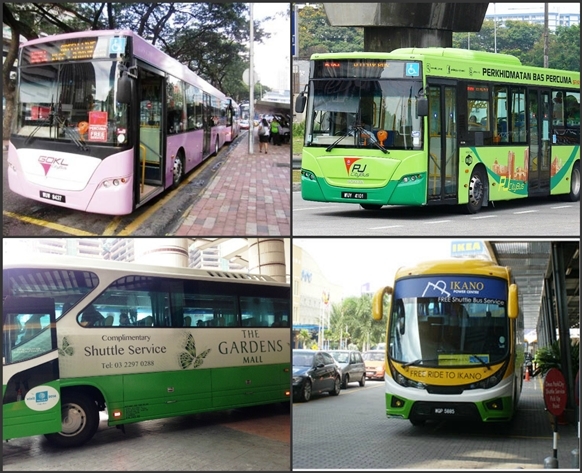 PJ also has a fleet of green shuttle buses serving the major residential and business hubs. Free, of course. For ladies who do not want to share their rides with men. If you want to avoid traffic jams and save time, take the LRT. They run on schedule and there's one arriving every 3-5 minutes except at night when you may have to wait slightly longer. Connectivity between the different lines has improved immensely. Now you can change lines using the same card. I remember there was a time when I had to queue for tickets each time I changed trains. What a hassle! My biggest gripe is reserved for our taxi service. The word itself is a misnomer. The drivers don't seem to know the meaning of 'service'. They exploit tourists, they choose their passengers, they don't use the meter and those that do don't issue receipts. The taxis are smelly, the seats dirty and some of the drivers could do with a course on grooming and manners. 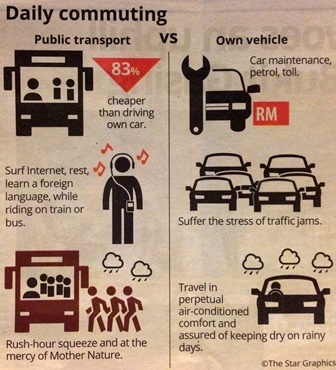 No wonder in a recent survey, KL has won the dubious honour of having the worst taxi drivers. Of course there are taxi drivers who are proud of their profession, and take great pride in keeping their taxis in showroom condition. Personally, I have yet to hail a taxi that refuses to take me to my destination. I don't understand this practice of asking the driver first whether he would go to a certain destination. I just get in, and then tell the driver where I want to go. 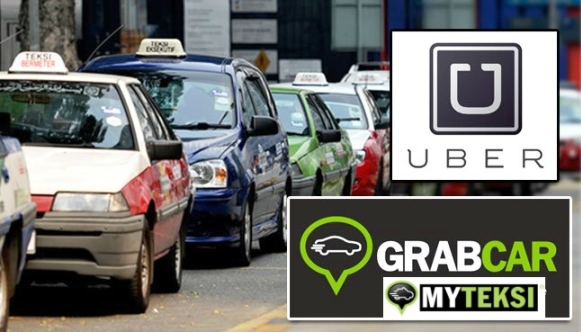 With MyTeksi and GrabCar coming into the picture, commuters are spoilt for choice. Service provided by these new entrants is good. The taxis are clean and comfortable. Most important of all, you feel safe as the driver's particulars are recorded on your phone. I have not taken Uber taxis so I can't comment on them, but feedback from my friends has been positive. By the time all my baby boomer friends reach an age when they can no longer drive, moving around in the city will be a breeze. Starting from 1 Dec, 2015, commuters will see even more improvements to the bus network. 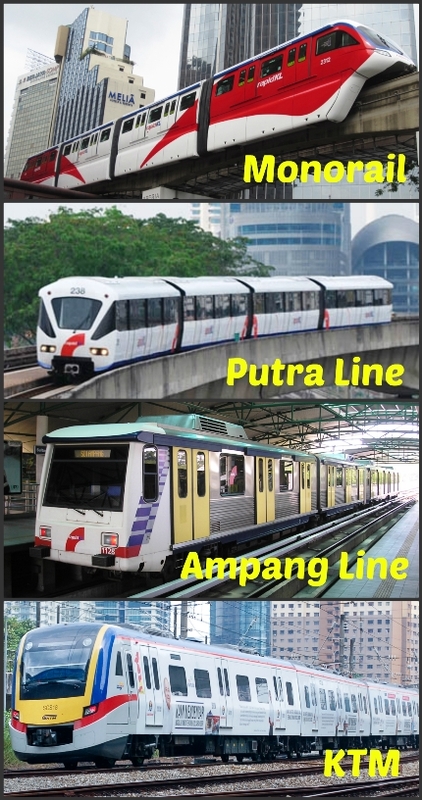 As you can see, it is possible to move around in the Klang Valley via public transport. I often take a mix of riding the bus, train and taxi to get to my destinations, Of course a bit of walking is involved too. But I consider that as exercise. Good for fitness and health. An umbrella, a bottle of water and a notebook - these are items I must pack in my bag before I set out for the day's destinations. And my RapidKL card, of course. I never leave home without it. A final glance at my checklist, and I am ready to go. So do I still want to get a car? What do you think? Can you do without a car? My first chance encounter with The Happy Buskers at Ampang Park LRT station. I recently spent two days with The Happy Buskers, accompanying them as they moved from one shopping mall to another to busk. If it is a challenge for senior citizens and the elderly to move around in the city via public transport or on foot, think how many times more daunting it is for these buskers - all retired and visually handicapped. My outing with the group happened by chance. I saw them busking behind the Ampang LRT station on Monday 19 October around lunch time. They looked somewhat lost and were totally unrehearsed for busking. I found out later they had just got together about three months ago. Yahya trying out the cajun beat box and cymbals. The group testing out the amplifier. I told them frankly that they couldn't be heard as their voices were drowned out by the noise from the traffic. 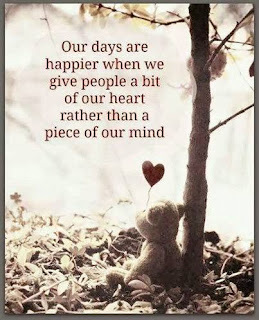 If passers-by dropped money in their pail, they probably did so out of kindness and sympathy. 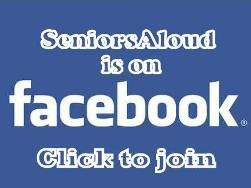 What would the group need for their busking that perhaps SeniorsAloud could provide, I asked. They took a few minutes to think it over, perhaps wondering if my offer was genuine. "Drums," said Yahya Ahmad, 61, who plays the organ for the group. "Ok. Let's check out the prices and see if drums are affordable," I told the group. "But first, how about lunch?" Their choice was the food court at Ampang Park across the busy road from the LRT station. We took the underpass, of course. They chose to walk up several flights of steps to the food court rather than take the lift. I found this strange, but didn't ask why. 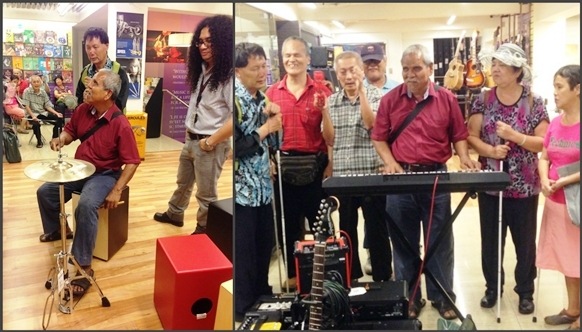 After lunch and toilet break, it was off to the music shop in Sungei Wang. Their decision again. Imagine what a challenge it was for the eight of us to make our way from Ampang Park to Sungei Wang, only to be told by the sales assistant at the shop that they didn't carry drums. So off we went, in single file along busy Jalan Bukit Bintang, and finally to Bentley near Pavilion. It was follow-the-leader all the way. The heavy traffic and throngs of people didn't faze them one bit. They had learned to entrust their safety to their leader. That role alternated between Long and Ah Ngau both of whom had partial vision. But in all other matters especially financial, Gordon was the leader by unanimous decision. I was curious to know how he contributed to the group. As far as I could tell, he neither sang nor played any music. But he did have the important task of holding the pail for donations, and was the most smartly attired - always in a long sleeved silk batik shirt despite the heat and dust of the city streets. It was much later that I found out Gordon, or more appropriately, Dr Gordon Tan, holds a PhD in Economics from the University of Malaya, and Godfrey has a degree in English Literature from the same university. Just goes to show we should never assume anything about anyone. The Roland Micro Cube GX didn't come cheap, but it was for a worthy cause. When we arrived at Bentley, Yahya was like a little boy let loose in a candy store. He gleefully tried out various musical instruments. The others sat quietly by, listening to Yahya testing out the instruments. Then the ladies spoke out. No drums, please, not even bongos - too loud. In the end, everyone agreed to getting an amplifier. It was a group decision. 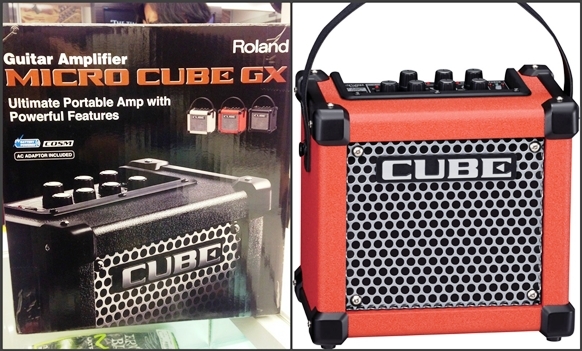 I could see how pleased they were with the purchase aka donation of a Roland Micro Cube GX amplifier. It could be used for a guitar, or any other instrument, such as Yahya's organ. From Bentley, we retraced our steps back to Lot 10. I left the group busking at the Lot 10-Sungei Wang link bridge. I didn't have time to listen to how they sounded with their new acquisition, as I had a meeting to rush off to. Two days later, I got a call from the group to meet them in Chinatown. They would be busking there from 12-2pm. Would I want to give them a listen? Of course! When I got to Chinatown, I followed the sound of their busking. Yes, this time they could be heard above the din of traffic and street vendors. I spotted the brand new red amplifier rightaway on the ground next to Yahya. The man himself was in his element as he sang and played one popular song after another to draw the crowds. Here's a video of the group busking in Chinatown, KL. What a difference the amplifier made! The buskers took a lunch break at 2pm. Where would you like to eat this time, I asked. "Subway," they replied without hesitation. Hmm, good choice but not exactly cheap. Later I found out the reason for their choice. Subway was around the corner, and the management allowed them to take a long rest there without harassing them. The short walk to Subway was like going on an obstacle course. We had to manoeuvre our way through, avoiding potholes, high kerbs and uneven pavements. 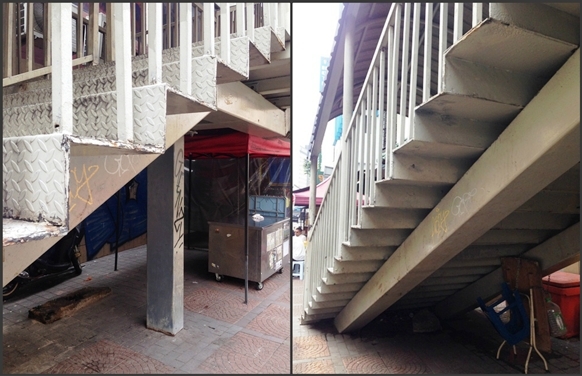 Note the sharp corners of the steps leading up to the overhead pedestrian bridge. Godfrey cut his forehead on one of the sharp metal edges when he was walking by. of steps to the top floor at Subway. (Above) Walking in single file, and carrying their musical instruments and stools. Not easy. I helped carry the stools most of the time except when I was photographing. 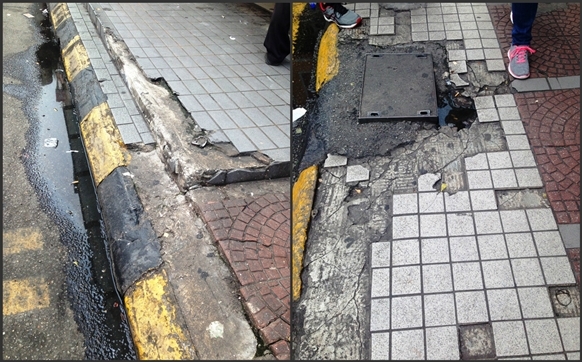 While I was taking this group photo at the bus-stop in Kota Raya, an elderly lady fell flat on her face, right beside us. She had probably misjudged the height of the kerb. Her daughters assured us that their mother was fine, but I could see she was badly shakened and could have sustained a sprained ankle. The ladies politely declined my offer of help to take their mother to the clinic nearby. I had expected Subway to be on the ground floor. Not this branch outlet. It occupied the first and second floors. The buskers preferred to eat on the second floor as it was quieter there and there were long cushioned benches they could stretch out on. Oh, did I mention the place had no lifts? So once again, we trooped up several flights of steps for a meal. Tucking into the sandwiches and cold drinks at Subway. It must have been such welcome relief for the buskers to finally sit down in air-conditioned comfort to rest their tired feet, enjoy ice-cold drinks to quench their parched throats and tuck into the sandwiches to fill their hungry stomachs. I take my hat off to these seniors who are out on the streets busking for hours 3-5 days a week to make ends meet. 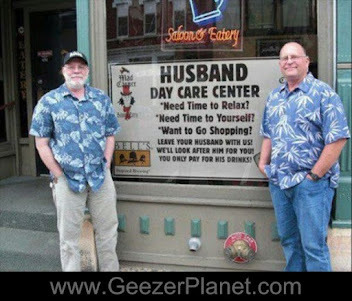 Not once did I hear them complain about anything. Nor did anyone raise their voice in argument or disagreement. Decision was by consensus, and once made, there was no further discussion on the matter. 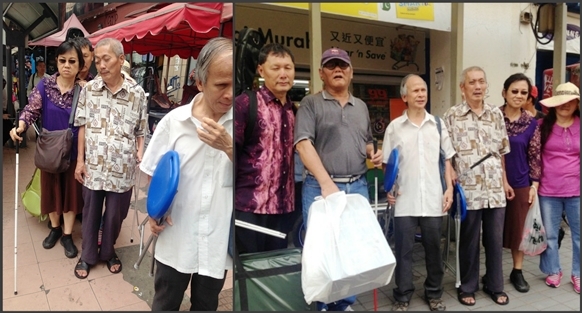 The Happy Buskers (seated from left) Yahya, 61, Godfrey, 67, Ah Ngau, 56. Standing from left: Leng Kee, 55, Mei Lian, 67, Long Boon Huat, 60, Gordon, 57. After the hour-long lunch break, it was back to Chinatown again for more busking. Unfortunately, their earlier spot was taken over by a bully of a fruit-seller. Although there was still space for the buskers, the bully shooed them off. The group didn't want to make a scene. They finally ended up at a vacant spot, vacant only because the vendor had not set up his stall yet for the night market. It was time for me to head home. The sky had turned dark and threatening. But for the Happy Buskers, a few minutes more of busking might mean a few ringgit more towards paying the bills at home. So that was where I left them, busking away with the help of that little red box. I am now limping a little because I was walking too much, carrying too much and climbing too much. What I went through pales in comparison with what these brave men and women do on a daily basis. I have learned plenty from the Happy Buskers. The heat, the rain, the exhaustion from busking for hours on their feet, the dangers they face on the roads, the intimidation by bullies - they took them all in their stride. Nor did they grumble or gripe about how tight-fisted some Malaysians were when the day's collection was less than hoped for and they had to split it seven ways. On a good day, each busker can take home RM100 on average. At their age and with their visual handicap, it is difficult for them to get jobs. They have no other means of income except from busking. 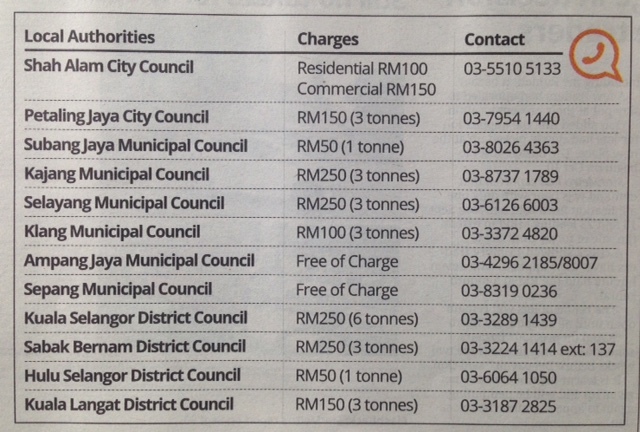 Godfrey gets RM350 a month from the Welfare Department (JKM). It has been almost a year since JKM stopped giving out welfare aid to the others. They have not been told why. Godfrey wants me to put on record that he appreciates City Hall's support in allowing the blind to busk in the city streets and other public places. Spending time with these buskers has taught me to be more resilient, to look at life philosophically, and to remain cheerful whatever the circumstances. It's all about adopting the right attitude to overcome challenges. I also realized that we often underestimate the capabilities of OKUs. The Happy Buskers have been walking the city streets and taking care of themselves long before they even knew me. 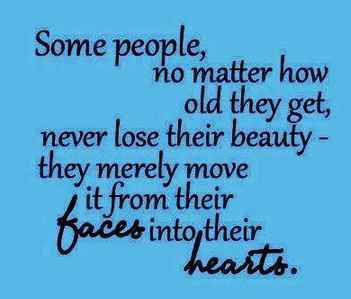 And they will continue to do so, I am certain. Thank you, Happy Buskers for the opportunity to learn from all of you. You have my deepest respect.